"Albeniz" redirects here. For other uses, see Albeniz (disambiguation). This name uses Spanish naming customs: the first or paternal family name is Albéniz and the second or maternal family name is Pascual. Isaac Manuel Francisco Albéniz y Pascual (Spanish pronunciation: [iˈsak alˈβeniθ]; 29 May 1860 – 18 May 1909) was a Spanish pianist and composer best known for his piano works based on folk music idioms. Transcriptions of many of his pieces, such as Asturias (Leyenda), Granada, Sevilla, Cadiz, Córdoba, Cataluña, and the Tango in D, are important pieces for classical guitar, though he never composed for the guitar. The personal papers of Albéniz are preserved, among other institutions, in the Biblioteca de Catalunya. Born in Camprodon, province of Gerona in Spain, to Ángel Albéniz (a customs official) and his wife, Dolors Pascual, Albéniz was a child prodigy who first performed at the age of four. At age seven, he passed the entrance examination for piano at the Conservatoire de Paris, but he was refused admission because he was believed to be too young. By the time he had reached 12, he had made many attempts to run away from home. His concert career began at the age of nine when his father toured both Isaac and his sister, Clementina, throughout northern Spain. A popular myth is that at the age of twelve Albéniz stowed away in a ship bound for Buenos Aires. He then found himself in Cuba, then to the United States, giving concerts in New York and San Francisco and then travelled to Liverpool, London and Leipzig, Germany. By age 15, he had already given concerts worldwide. This over-dramatized story is not entirely false. Albéniz did travel the world as a performer; however, he was accompanied by his father, who as a customs agent was required to travel frequently. This can be attested by comparing Isaac's concert dates with his father's travel itinerary. In 1876, after a short stay at the Leipzig Conservatory, he went to study at the Royal Conservatory of Brussels after King Alfonso's personal secretary, Guillermo Morphy, obtained him a royal grant. Count Morphy thought highly of Albéniz, who would later dedicate Sevilla to Morphy's wife when it premiered in Paris in January 1886. In 1880 Albéniz went to Budapest, Hungary to study with Franz Liszt, only to find out that Liszt was in Weimar, Germany. In 1883 he met the teacher and composer Felip Pedrell, who inspired him to write Spanish music such as the Chants d'Espagne. The first movement (Prelude) of that suite, later retitled after the composer's death as Asturias (Leyenda), is probably most famous today as part of the classical guitar repertoire, even though it was originally composed for piano. (Many of Albéniz's other compositions were also transcribed for guitar, notably by Francisco Tárrega.) At the 1888 Barcelona Universal Exposition, the piano manufacturer Érard sponsored a series of 20 concerts featuring Albéniz's music. The apex of Albéniz's concert career is considered to be 1889 to 1892 when he had concert tours throughout Europe. During the 1890s Albéniz lived in London and Paris. For London he wrote some musical comedies which brought him to the attention of the wealthy Francis Money-Coutts, 5th Baron Latymer. Money-Coutts commissioned and provided him with librettos for the opera Henry Clifford and for a projected trilogy of Arthurian operas. The first of these, Merlin (1898–1902), was thought to have been lost but has recently been reconstructed and performed. Albéniz never completed Lancelot (only the first act is finished, as a vocal and piano score), and he never began Guinevere, the final part. In 1900 he started to suffer from Bright's disease and returned to writing piano music. Between 1905 and 1908 he composed his final masterpiece, Iberia (1908), a suite of twelve piano "impressions". In 1883 the composer married his student Rosina Jordana. They had three children: Blanca (who died in 1886), Laura (a painter), and Alfonso (who played for Real Madrid in the early 1900s before embarking on a career as a diplomat). Two other children died in infancy. Albéniz died from his kidney disease on 18 May 1909, eleven days short of his 49th birthday, in Cambo-les-Bains, in Labourd, south-western France. Only a few weeks before his death, the government of France awarded Albéniz its highest honor, the Grand-Croix de la Légion d'honneur. He is buried at the Montjuïc Cemetery, Barcelona. Performed on a guitar by Gordon Rowland. During the late 1880s, the strong influence of Spanish style is evident in Albéniz's music. In 1883 Albéniz met the teacher and composer Felipe Pedrell. Pedrell was a leading figure in the development of nationalist Spanish music. In his book The Music of Spain, Gilbert Chase describes Pedrell's influence on Albéniz: "What Albéniz derived from Pedrell was above all a spiritual orientation, the realization of the wonderful values inherent in Spanish music." Felipe Pedrell inspired Albéniz to write Spanish music such as the Suite española, Op. 47, noted for its delicate, intricate melody and abrupt dynamic changes. 1. The dance rhythms of Spain, of which there are a wide variety. 2. The use of cante jondo, which means deep or profound singing. It is the most serious and moving variety of flamenco or Spanish gypsy song, often dealing with themes of death, anguish, or religion. 3. The use of exotic scales also associated with flamenco music. The Phrygian mode is the most prominent in Albéniz's music, although he also used the Aeolian and Mixolydian modes as well as the whole-tone scale. 4. The transfer of guitar idioms into piano writing. Taking the guitar as his instrumental model, and drawing his inspiration largely from the peculiar traits of Andalusian folk music‍—‌but without using actual folk themes‍—‌Albéniz achieves a stylization of Spanish traditional idioms that while thoroughly artistic, gives a captivating impression of spontaneous improvisation... Córdoba is the piece that best represents the style of Albéniz in this period, with its hauntingly beautiful melody, set against the acrid dissonances of the plucked accompaniment imitating the notes of the Moorish guslas. Here is the heady scent of jasmines amid the swaying palm trees, the dream fantasy of an Andalusian "Arabian Nights" in which Albéniz loved to let his imagination dwell. While Albéniz's crowning achievement, Iberia, was written in the last years of his life in France, many of its preceding works are well-known and of great interest. The five pieces in Chants d'Espagne, (Songs of Spain, published in 1892) are a solid example of the compositional ideas he was exploring in the "middle period" of his life. The suite shows what Albéniz biographer Walter Aaron Clark describes as the "first flowering of his unique creative genius", and the beginnings of compositional exploration that became the hallmark of his later works. This period also includes his operatic works‍—‌Merlin, Henry Clifford, and Pepita Jiménez. His orchestral works of this period include Spanish Rhapsody (1887) and Catalonia (1899), dedicated to Ramon Casas, who had painted his full-length portrait in 1894. There are among them a few things that are not completely worthless. The music is a bit infantile, plain, spirited; but in the end, the people, our Spanish people, are something of all that. I believe that the people are right when they continue to be moved by Córdoba, Mallorca, by the copla of the Sevillanas, by the Serenata, and Granada. In all of them I now note that there is less musical science, less of the grand idea, but more color, sunlight, flavor of olives. That music of youth, with its little sins and absurdities that almost point out the sentimental affectation ... appears to me like the carvings in the Alhambra, those peculiar arabesques that say nothing with their turns and shapes, but which are like the air, like the sun, like the blackbirds or like the nightingales of its gardens. They are more valuable than all else of Moorish Spain, which though we may not like it, is the true Spain. Arranged for saxophone and piano, performed by Wasei Dúo at Museum of Romanticism (Madrid) on November 3, 2015. Duration is 2:25. Albéniz's influence on the future of Spanish music was profound. His activities as conductor, performer and composer significantly raised the profile of Spanish music abroad and encouraged Spanish music and musicians in his own country. Albéniz's works have become an important part of the repertoire of the classical guitar, many of which have been transcribed by Miguel Llobet and others, and popularized by Andrés Segovia. Asturias (Leyenda) in particular is heard most often on the guitar, as are Granada, Sevilla, Cadiz, Cataluña, Córdoba and the Tango in D. Gordon Crosskey and Cuban-born guitarist Manuel Barrueco have both made solo guitar arrangements of six of the eight-movement Suite española. Selections from Iberia have rarely been attempted on solo guitar but have been very effectively performed by guitar ensembles, such as the performance by John Williams and Julian Bream of Iberia's opening "Evocation". The Doors incorporated "Asturias" into their song "Spanish Caravan"; also, Iron Maiden's "To Tame a Land" uses the introduction of the piece for the song bridge. More recently, a guitar version of Granada functions as something of a love theme in Woody Allen's 2008 film Vicky Cristina Barcelona. The 2008 horror film Mirrors incorporates the theme from Asturias into its score. In 2003 "Trio Campanella" made a world premier recording of Christophe Dejour' arrangement for three guitars of Albéniz’ masterwork Iberia (Naxos, 8.557064), the recording was met with international praise. In 1997 the Fundación Isaac Albéniz was founded to promote Spanish music and musicians and to act as a research centre for Albéniz and Spanish music in general. A film about his life entitled Albéniz was made in 1947. It was produced in Argentina. Catalanes de Gracia. Lost music. Tres suites antiguas (Three ancient suites) (1885–1886). Suite española, Op. 47 (Spanish suite). With 8 pieces: Granada, Cataluña, Sevilla, Cádiz, Asturias, Aragón, Castilla and Cuba. Suite española, Op. 97. 4 pieces: Zaragoza, Sevilla, Cadix-gaditana, and Zambra granadina (1883–88) (1889). España, Op. 165. 6 pieces: Preludio, Tango, Malagueña, Serenata, Capricho Catalán and Zortzico (1890). Doce piezas características (Twelve characteristic pieces) (1888). Recuerdos de viaje (Travel memories), Op. 71. 7 pieces: En el mar, Leyenda, Alborada, En la Alhambra, Puerta de Tierra, Rumores de la caleta, En la playa (1886–1887). 1º quadern: Evocación, El Puerto, El Corpus Christi en Sevilla. Navarra, finished by his pupil Déodat de Séverac. 2 concertos for piano and orchestra: Concerto Fantastico, 1st, 1885–1887; 2nd concerto (1892), unfinished. Rapsodia española (Spanish Rhapsody), for piano and orchestra (1887). Symphonic versions of Iberia have been arranged by Enrique Fernández Arbós, Carlos Surinach, and Peter Breiner. There is a piano and orchestra version of Rapsodia española by Cristóbal Halffter. ↑ Clark, Walter Aaron (15 May 2002). Isaac Albéniz: Portrait of a Romantic. Oxford University Press. p. 36. ISBN 978-0-19-925052-3. Retrieved 24 March 2012. ↑ Clark, Walter Aaron (15 May 2002). 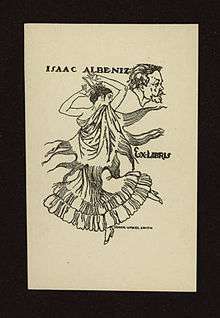 Isaac Albéniz: Portrait of a Romantic. Oxford University Press. p. 69. ISBN 978-0-19-925052-3. Retrieved 24 March 2012. Barulich, Frances. Albéniz, Isaac. In Grove Music Online. Oxford Music Online, http://0-www.oxfordmusiconline.com.catalogue.ulrls.lon.ac.uk/subscriber/article/grove/music/00421 (accessed 7 March 2010). Baytelman, Pola. Isaac Albéniz: Chronological List and Thematic Catalog of His Piano Works, Harmonie Park Press, Michigan 1993. Chase, Gilbert. The Music of Spain, Dover Publications Inc. New York, 1959. Clark, Walter Aaron. Isaac Albéniz: A Guide to Research, Garland Publishing Inc. New York & London, 1998. Clark, Walter Aaron. Isaac Albéniz: Portrait of a Romantic, Oxford University Press, New York 1999. Ericourt, Daniel; Erickson, Robert. P. MasterClasses in Spanish Piano Music, Hinshaw Music, Chapel Hill North Carolina, 1984. Jean-Aubry, G. "Isaac Albéniz 1860–1909", in The Musical Times, Vol 58, No. 898, Musical Times Publications Ltd., December 1917 pgs 535–538. Marco, Thomas. Spanish Music in the Twentieth Century. 1993. Fineman, Yale. "The Life and Music of Isaac Albéniz". University of Maryland Libraries. Archived from the original on 20 August 2012. Retrieved 5 September 2013.